CashCrate is a free rewards program (GPT site) which was launched in 2006 and since then it has paid over $3,910,841.32 to its members. Like the traditional GPT sites, CashCrate pays you to try new products and sign up for websites and services. You can also earn cash for taking and completing research surveys, shopping, playing games, etc. The best way to earn money on CashCrate is with referrals. 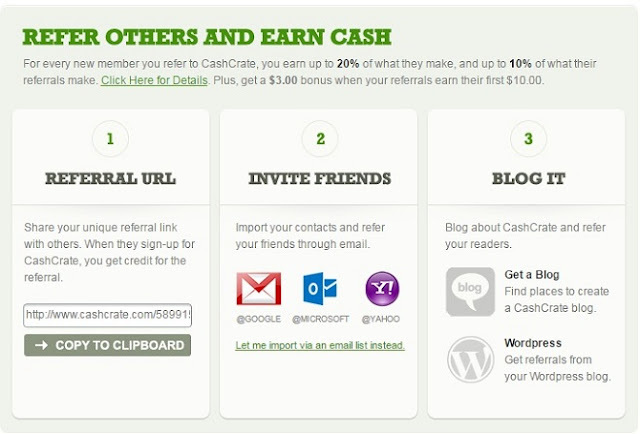 CashCrate has one of the best referral systems that I've reviewed. You also get $1 when you complete your profile. It will take less than 2 min. CashCrate has a colourful and easy-to-navigate design. You can easily find what you need. Is CashCrate Legit or Scam? This is the first question that pops up in my mind when I first hear about any online money earning website. And I know, you also want to find out; whether CashCrate is Legitimate or scam. Good news for you, CashCrate is 100% legit and paying. Old. CashCrate was launched in 2006. 10years ago. 2 million members. Currently CashCrate has over 2 million members worldwide making money with its free program. $3,910,841. 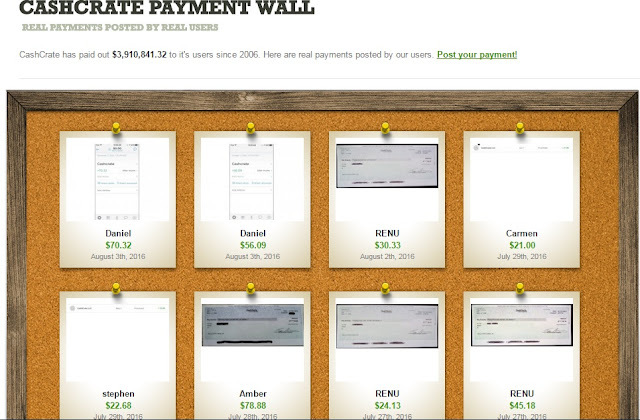 Since 2006 CashCrate has paid $3,910,841 to its members. Free to Join. CashCrate is free-to-join and never asks you to pay anything to receive your payment. Fans. CashCrate’s Facebook page has 23665 likes and 5,796 FOLLOWERS on Twitter. Now, you believe that CashCrate is legit? Why Does CashCrate Pay You? There are many companies looking for new users to try their products and services (offers). They also need your opinion to improve their product and services (surveys). These companies pay CashCrate when you take complete offers or research surveys, CashCrate just passes on a part of that money to you. If it didn’t why would you bother to these things anyway? Below I've explained the earning methods offered by CashCrate. Since CashCrate is not a Survey Company it provides you surveys from other survey companies like Peanut Labs, YourSurveys, etc. CashCrate has 3 sections that are dedicated to Surveys; ‘Surveys’, ‘Top Surveys’ and ‘Bonus Surveys’. Bonus Surveys are offered by Peanut Labs. Despite the three sections, the highest paying surveys are found within the Survey Section. To get most out of surveys be sure to complete your survey profile. Filling out your survey profile helps survey providers to get you more and relevant surveys, surveys that you may qualify for and have better chance of completing. You can fill your survey profile in survey section. Like the term suggests you can complete these surveys every day. Daily surveys are available to you after every 24 hours. After you complete a daily survey, you can complete that survey again after 24 hours. Free offers: Free offers mainly require you to sign up for their websites to try their services like, daily newsletters of free sample products. Paid offers: To complete a paid offer you will need to spend some amount of money. Carefully read the description before completing paid offers. You can choose to view paid, free or all offers by using the ‘Show’ drop-down menu. And view highest paying offers from sort menu, by selecting ‘Payout’. More offers for you to make money with on CashCrate. You get cash back when you shop through CashCrate at your favorite online retail store (eCommerce websites). I’ve never had the chance to test it. Because shopping offers are currently not available. In this section you earn cash to watch videos and for completing offers from Persona.ly, RadiumOne, Encrave and SuperRewards. Cash Tasks tab is located right below the SuperRewards tab, in Videos & more section. Cash Tasks are offered to by CrowdFlower. Earning from Cash Tasks is very low. You will barely earn 2 to 5 cents for completing one Cash Task. My advice is to stay away from Cash Tasks and invest your time in better-paying sections like offers and surveys. Or you can register on crowdsourcing websites like MTurk, Microworkers, Clickworkers, etc. and complete small tasks to earn extra cash. These (crowd sourcing) websites have better-paying offers because Tasks are directly posted by the publisher/employer. To earn through the searches you make with CashCrate’s search bar you need to earn $1 with offers (not bonus offers). When you earn $1 (with offers) the search bar is unlocked for the day (only for that day in which you earned $1 with offers). Yeah, you’ll have to earn $1 first before you can start earning with searches. The next day earn another $1 to unlock the search bar. Yep, I know it’s pretty sucky. 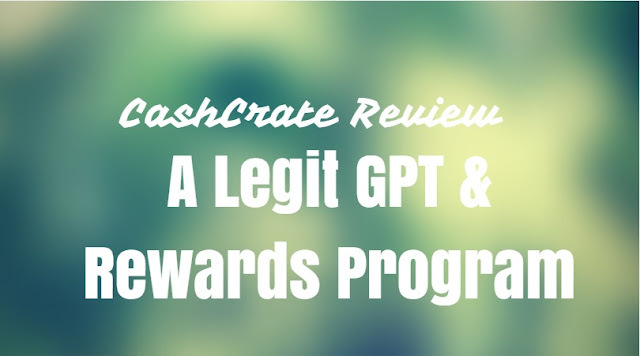 There are other GPT sites that have more beneficial Search & Earn program than CashCrate. Swagbucks and InboxDollars are some of them. While Swagbucks will occasionally pay (not for every search) for the searches you make, InboxDollars will pay you for every 4 searches. You’ll also receive a loyalty bonus of $0.05 when you search for 4 days, in a week. InboxDollars Review: How to Make Money with InboxDollars? You can earn points for socialising (for example, staying active on CashCrate forum), playing games and also when you win contests. You can’t redeem these Points for cash or convert it into cash. Instead, you can get prizes/gift cards for them. I saved the best for the last. Yes, referring users is the most beneficial way to earn on CashCrate! But, why referring is most profitable? What’s so special about it? Every GPT site has a referral system. But, how many GPT sites have 2 level referral system? And on which site, you can earn up to 30% of what your referrals make and 20% of their referrals earnings? On CashCrate you start out as bronze level member. As a Bronze level member you earn 20% of what your referrals earn and 10% of their referrals earn. As you refer more users to CashCrate your levels increases (you level up) and earn more from your referrals as well as their referrals. Your referral earnings increase until you are earning 30% from your referrals earnings and 20% from their referrals earnings. • You earn $3 when your referrals make their first $10. • $0.05 when your referrals complete a bonus offer. • $0.05 when your referrals complete a bonus survey. See this detailed explanation of CashCrate's referral system. Cash: Minimum cash payout is $20. Points: To redeem your points you need to earn at least 250 points. For 250 points you can redeem a $10 Amazon gift card. You can receive your cash payment via Check or PayPal and redeem your points for prizes/gift cards. To be eligible to get paid via PayPal you must reach the silver level and receive at least one check. 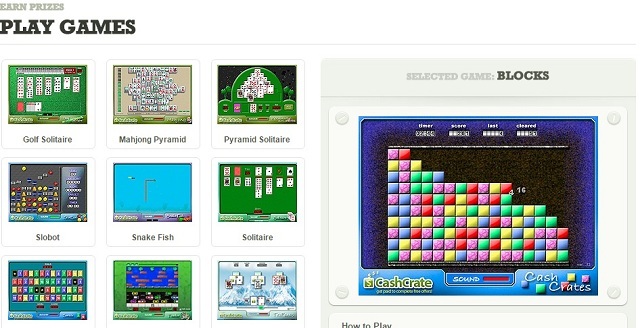 CashCrate is free to join and gifts a bonus of $1 to its new members when they complete their profile. CashCrate first made its appearance 10 years ago. Over 2 million users have joined CashCrate and still counting. The best part is, it’s and completely worthy of your trust there is no doubt about the legitimacy of CashCrate. So, yes you can join CashCrate and earn some cash on the side. without worrying about the legitimacy of the site. Please do share your thoughts about this review of CashCrate. What do you think is the best way to earn from CashCrate?